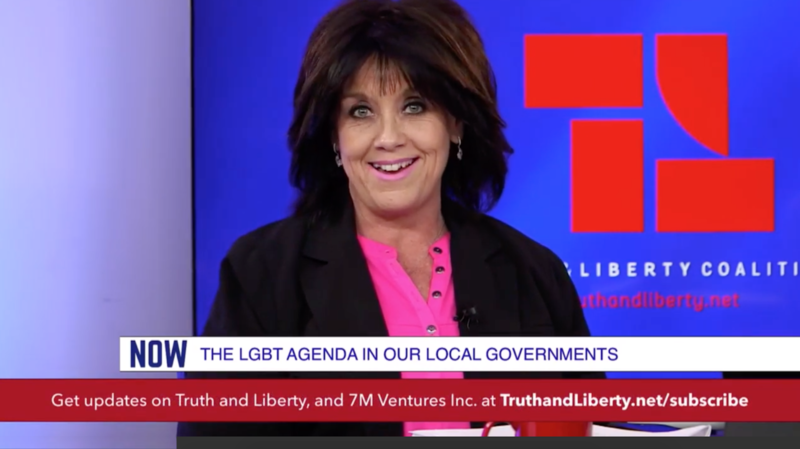 Local broadcast news faces a challenge when covering politics–how to distill complex topics into brief segments that rarely run longer than four minutes? Last week 9News’ Marshall Zelinger sat down with Congressman Ken Buck, the newly elected chairman of the Colorado Republican Party. The wide-ranging interview only lasted 3 minutes 30 seconds on air, which is why 9News’ decision to post the entire raw footage of the interview is so important. At 9:45 Zelinger asks Buck if it’s appropriate for elected officials and their families to profit from recalls they’re promoting publicly. Zelinger: House Minority Leader Patrick Neville has come out supporting recalls. His family could benefit from recalls because that’s their business. Should it be appropriate for elected officials and their families to profit off of recalls and elections? By being hired for election purposes–this is an added election outside of a cycle–perhaps this is being done in a way that benefits the family business? Buck initially says he doesn’t understand, but then gives a response that indicates he does understand, but that he doesn’t want to get involved. One Republican insider told Colorado Politics he didn’t mind if Joe Neville and his companies make money off their political activities. But, he said, the lack of results in terms of election wins for the GOP is another matter… Another concern among Republicans who talked with Colorado Politics: what appears to be a large amount of unspent money left over after the election. By early March, it was clear where at least some of that unspent money was headed- paying for recalls. House Minority Leader Patrick Neville launched a website to support recalling his own colleagues in the legislature. 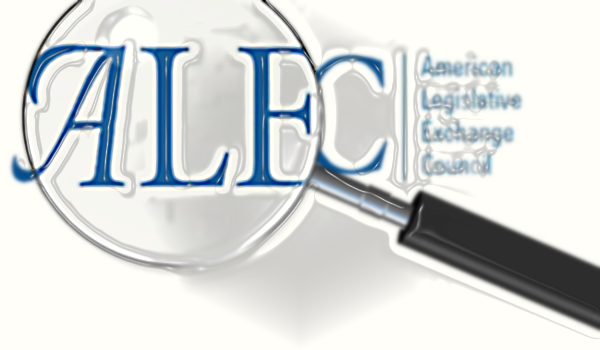 At least one corporate donor, Xcel Energy, expressed surprise that some of its 2018 contribution to the GOP House caucus fund was now being used for recalls. 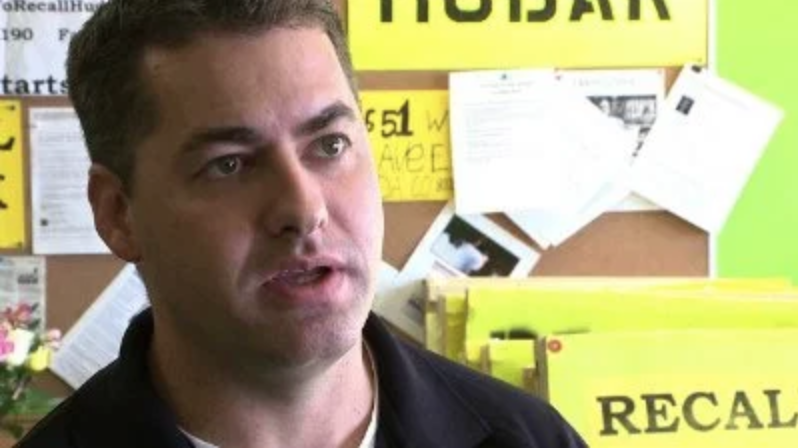 More recently, 9News’ Kyle Clark noted that both former Secretary of State Scott Gessler and also the conservative Independence Institute are both generating revenue from another proposed Colorado recall, the moonshot that is the attempt to remove Governor Jared Polis. State law dictates that petition gathering for a gubernatorial recall can’t begin until at least six months into the governor’s term, but there are no restrictions on when political operatives can start gathering checks from naive donors. The red meat was indeed raw and juicy at the Colorado Republican Central Committee meeting last month. 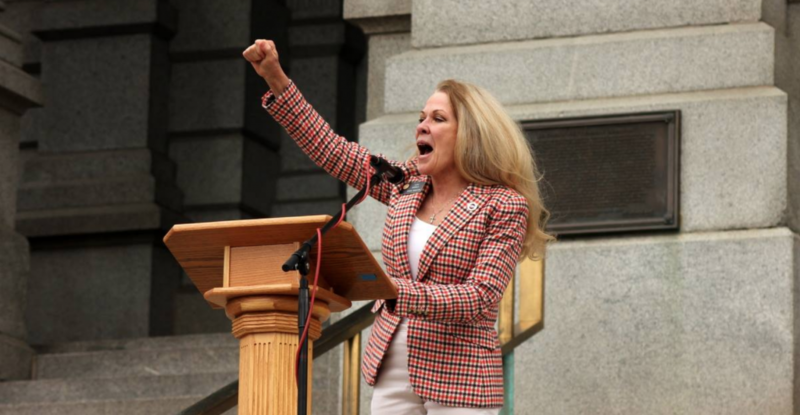 Compared to violent language and imagery favored by Buck, Gardner, and Brauchler, University of Colorado Regent Heidi Ganahl’s speech was relatively tame. This straightforward endorsement wouldn’t be significant were it not for the fact that during her 2016 campaign for CU Regent, Ganahl refused to even utter the name of her party’s presidential candidate. At last weekend’s Colorado Republican Central Committee meeting, Senator Cory Gardner gave Congressman Ken Buck such a full-throated endorsement that his voice almost cracked. Coming from the highest profile Republican in the room, Gardner’s endorsement helped Buck secure his victory over Rep. Susan Beckman. Three days later, Buck made national news for comparing a lesbian mom to a Nazi to her face during a House Judiciary hearing on the Equality Act. 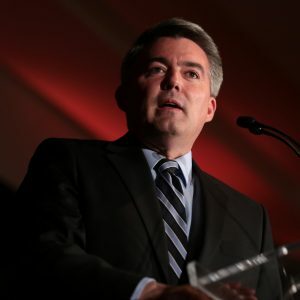 Sen. Cory Gardner returns to Colorado on Friday, but he’s bringing Washington with him. He’s hosting a fundraiser breakfast with Sen. John Thune (R-SD) at a country club in Cherry Hills Village. 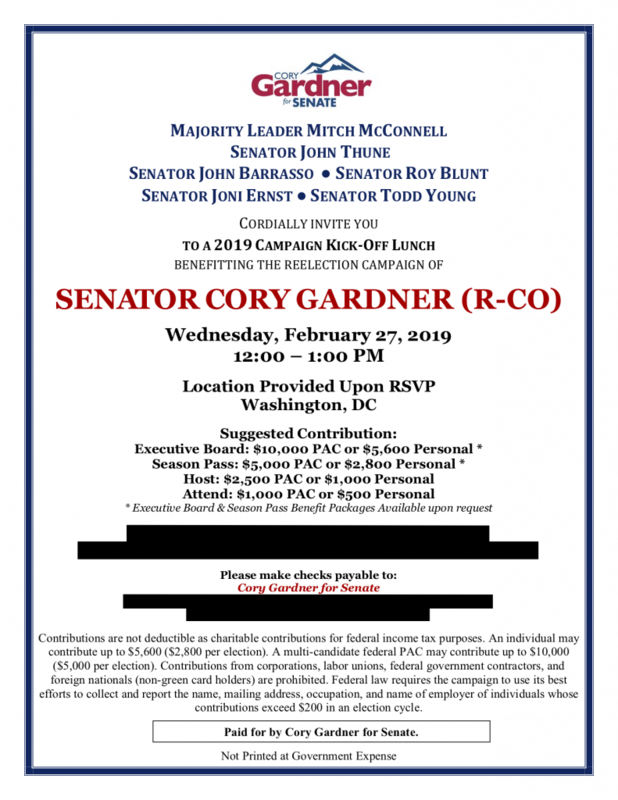 Gardner, who is under fire from his constituents for not holding a public event since September of 2017, is spending his time on high-dollar donor events: he’s held at least four since the beginning of the year, all in Washington, DC. Just yesterday, the Gardner campaign invited DC’s high rollers to an undisclosed location to have margaritas…for $500. “Yes, some of the donors are. We have plenty of donors who do know what we’re doing with this. We don’t plan on spending every penny into this, but we are going to spend what it takes to get things done. Our goals are to make sure we have the tools available and the resources available for people in the grassroots who choose to put up a recall, if it makes sense for the organization and for being good stewards for our donors. If it helps the cause of getting back the majority and there’s reason for it, then we’ll be there to help people. It’s been a busy week both online and in real life for the South Jeffco Tea Party. 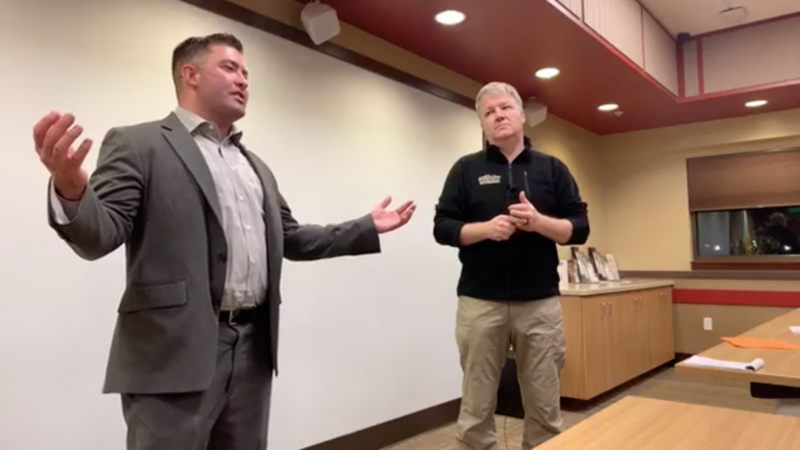 On Tuesday one of its members called out the Republican establishment in no uncertain terms and tonight the group is hosting a VIP Meet & Greet followed by a public forum for state GOP party official candidates. The website the House Minority leader is referring to was created and paid for by Values First Colorado, the House Republicans’ 527 political committee. That entity is run by Patrick’s brother Joe Neville, who previously worked as Political Director for Rocky Mountain Gun Owners (RMGO). Rocky Mountain Gun Owners organized Thursday’s event, enticing RMGO members to the Centennial Gun Club with the promise of a free hour of range time. RMGO staff broadcast the entire event on Facebook live. 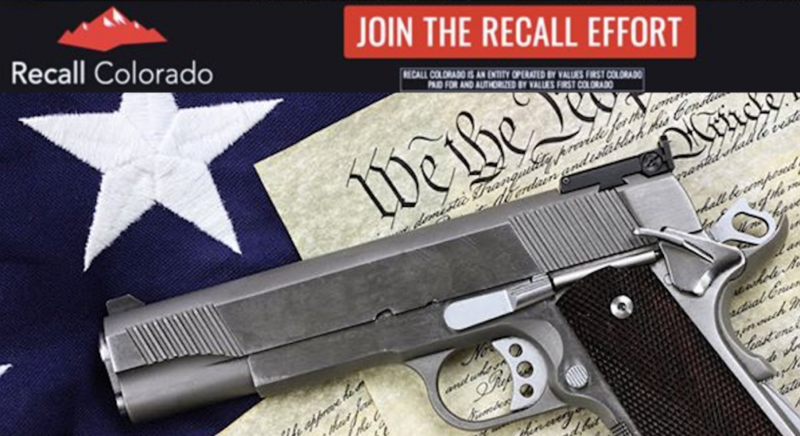 Director Dudley Brown spoke largely about two topics: the Extreme Risk Protection Order bill, or “red flag” measure, which would allow judges to allow the confiscation of guns from dangerous people, and “the R-word” as he called it: recalls. Brown mentioned the two state legislators, Sen. Jeff Bridges (D-Greenwood Village) and Rep. Meg Froelich (D-Englewood) who are already named on the recall website created by Patrick Neville and his brother Joe (who also attended the briefing). House Minority Leader Patrick Neville’s threats to recall his own colleagues aren’t just words anymore. He’s endorsed his caucus’ fundraising committee, run by his brother Joe, which has launched recall efforts against at least two Democrats. 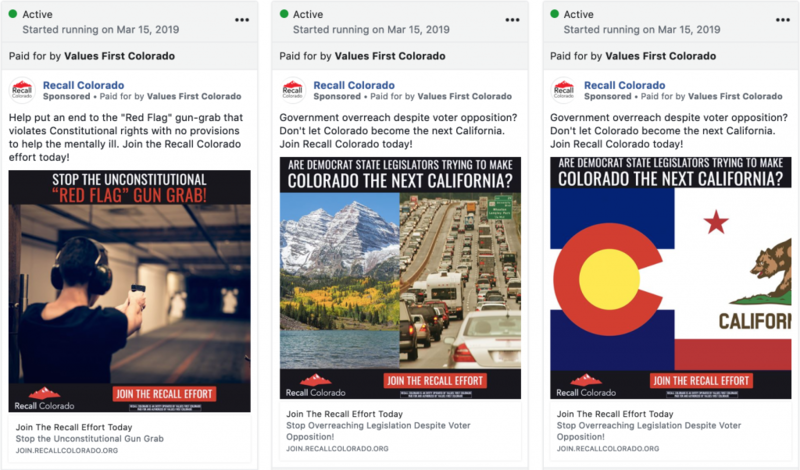 Late Wednesday Minority Leader Patrick Neville shared a link to “Recall Colorado,” a website built and paid for by Values First Colorado, the Republican House Independent expenditure committee run by his older brother Joe’s consulting firm, Rearden Strategic. The link was also shared by “Advancing Colorado,” an online attack brand also run by Rearden. The site makes no mention of another “announced” bill that initially prompted Neville to publicly threaten to recall his fellow legislators: the safe injection site bill to address the opioid crisis. 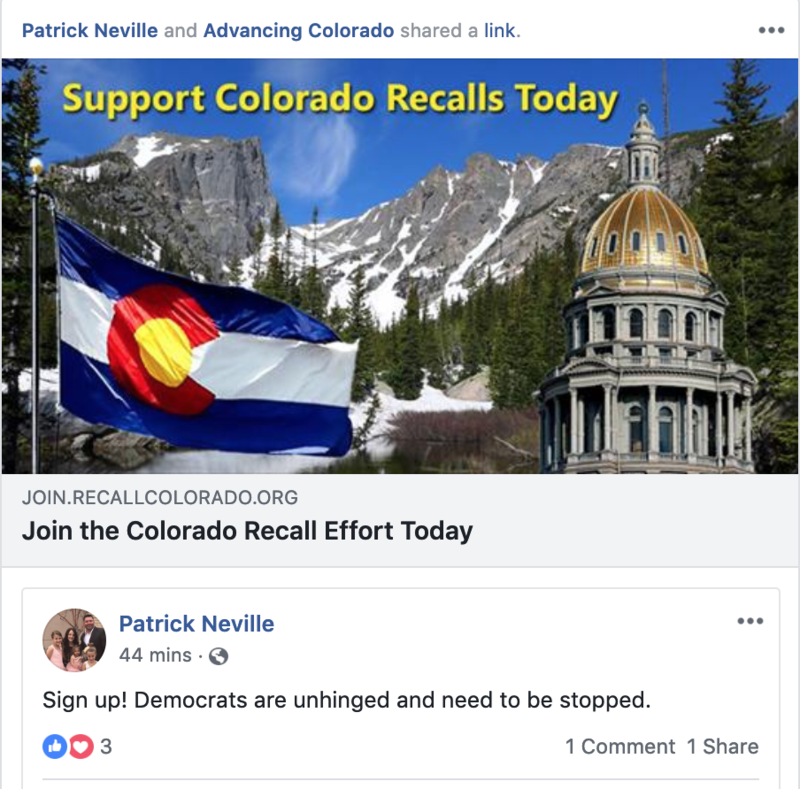 Neville purported to be so upset by that bipartisan proposal he told 9News he would recall the bill’s Democratic sponsor, though not the Republican one. That bill was eventually dropped, but House Minority Leader Neville apparently never dropped his threatened response. 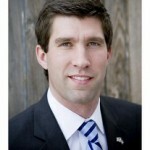 Several Republicans who spoke with Colorado Politics said they believe the Nevilles’ key objective in 2018 was to ensure that Republicans elected to the House would vote for Patrick Neville as minority leader for another term, which, in turn, would keep donor dollars flowing into various committees and companies controlled by Joe Neville. According to campaign finance filings with the state, Joe Neville and his firm Rearden Strategic were paid $194,360 in fees for consulting with political committees and candidates during the 2018 election cycle, including $114,716 from Republican caucus funds and the rest from candidates. In the second story, titled “A hard look at 2018 GOP’s soft money,” Goodland laid out a complex trail of money moving between various Neville-controlled groups, the end result of which was a lot of unspent cash and un-won races. Values First Colorado routed additional money to at least two other IECs run by Joe Neville: Coloradans for Secure Borders and the Colorado Liberty PAC. Out of the total of $416,150 raised by the Colorado Liberty PAC, $393,000 came from Values First Colorado. The committee spent $264,580, leaving an ending balance of $152,009 after the final reports for the 2018 election cycle were filed on Dec. 6. Rearden Strategic and its employees, Joe Neville and Yates, got $11,416 for consultant services from the Liberty PAC and another $239,886 to do advertising on behalf of a dozen Republican House candidates. Of those dozen candidates, 11 lost their races. … After raising $1.214 million, the Values First Colorado caucus-fund committee and its related IECs left ending balances of $305,961, just over a quarter of what the GOP House caucus raised for the 2018 election. 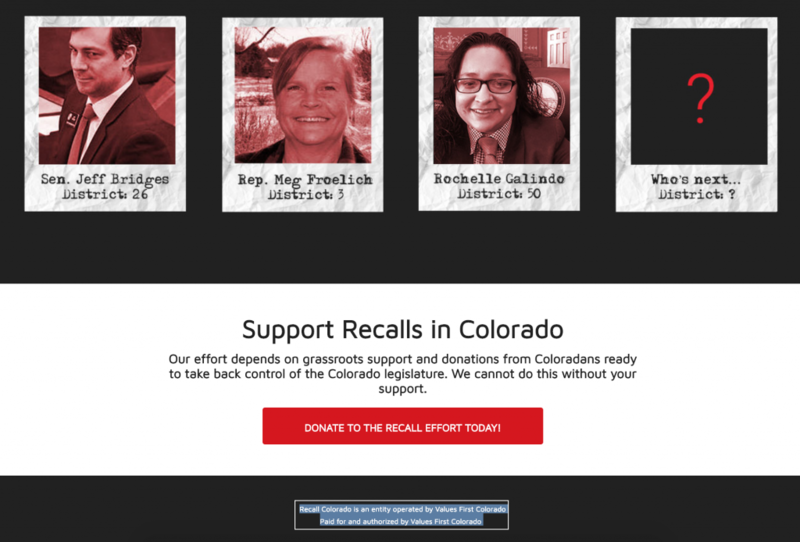 It’s unclear whether Values First Colorado is using the leftover funds from 2018 to pay for this recall effort, but it certainly has enough in the bank to do so. Calls to Minority Leader Neville and to Values First Colorado inquiring about the funding for the recall effort were not immediately returned. This piece will be updated with any response. State Senator Vicki Marble (R-Fort Collins), the third ranking member of her party’s leadership team, proposed secession as “recourse” to a “global agenda,” represented by a bill to strengthen health and safety rules for the oil & gas industry. No discussion, no stakeholder process, and no consideration for the hundreds of thousands of workers in oil and gas and their families. 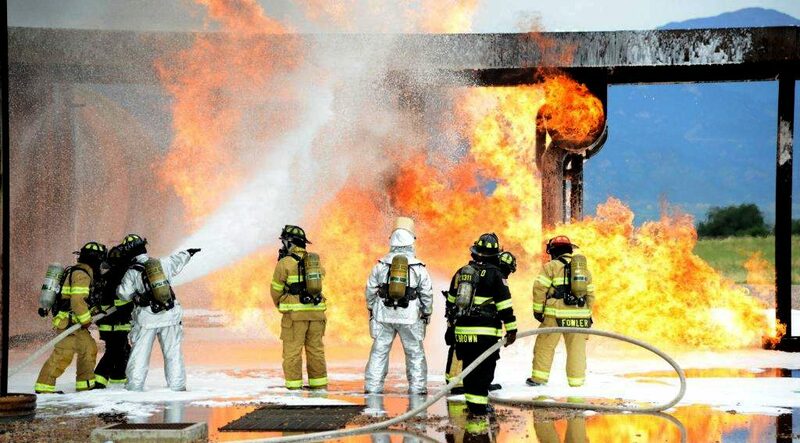 Democrats have declared war on oil and gas and have deemed these workers and their families as “collateral damage.” Unacceptable, and I’ll fight it ever step of the way. 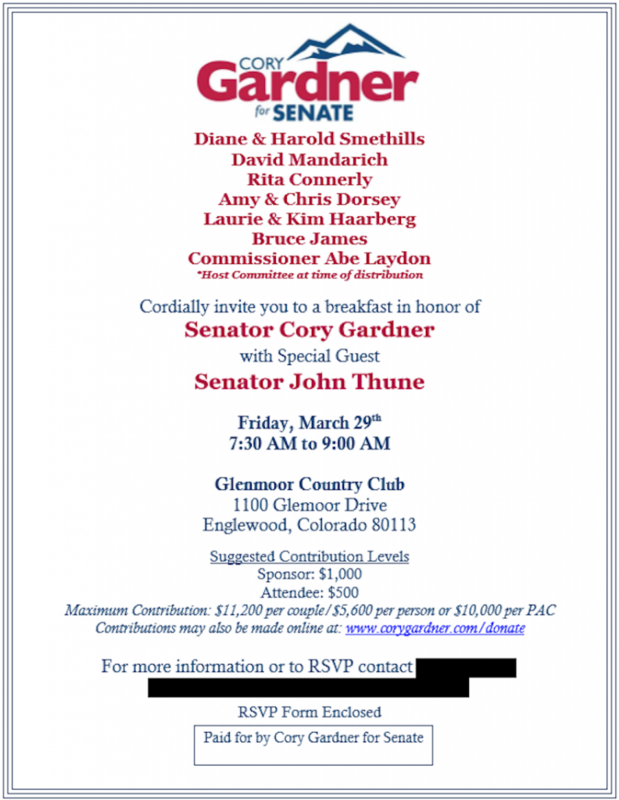 Senator Cory Gardner has had a busy fundraising schedule so far this year. In addition to a pair of high-dollar events last month, his official campaign kick-off luncheon takes place Wednesday at an undisclosed Washington DC location, where he’ll be joined by Majority Leader Mitch McConnell and the entire Senate leadership team. But Gardner isn’t just holding his own hand out, he’s helping other Republicans in need as well. Just one week ago he was in New York City to help the New York GOP squeeze a few dollars out of their high-rolling members. 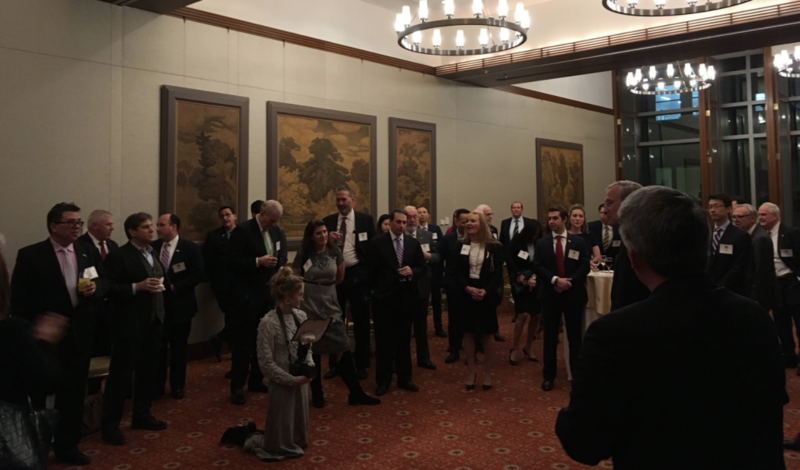 Speaking at an exclusive reception for the party’s Empire Club, Gardner entertained the crowd with tales of NRSC victories from the 2018 election. 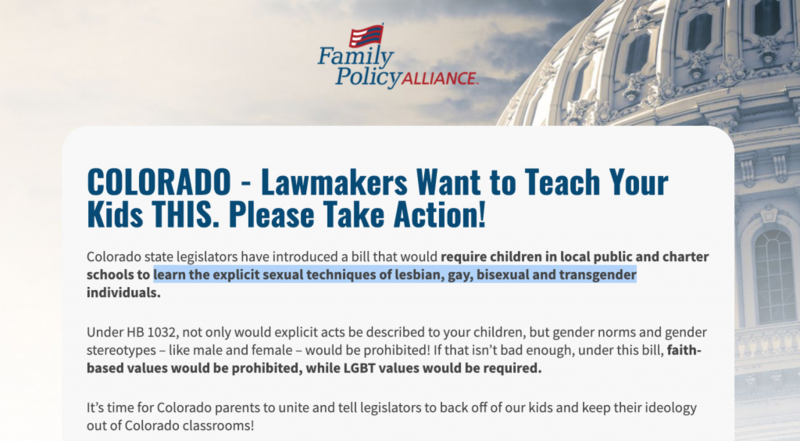 Colorado Family Action director Debbie Chaves used a dangerous and false stereotype of LGBT people to oppose a proposed bill banning conversion therapy for minors. Mesa County Commissioner Rose Pugliese promoted the event on her Facebook page. Pugliese has publicly rejected global warming, saying, “It is not a proven scientific theory. There is not evidence to support it.” Pugliese did not return a call requesting comment. 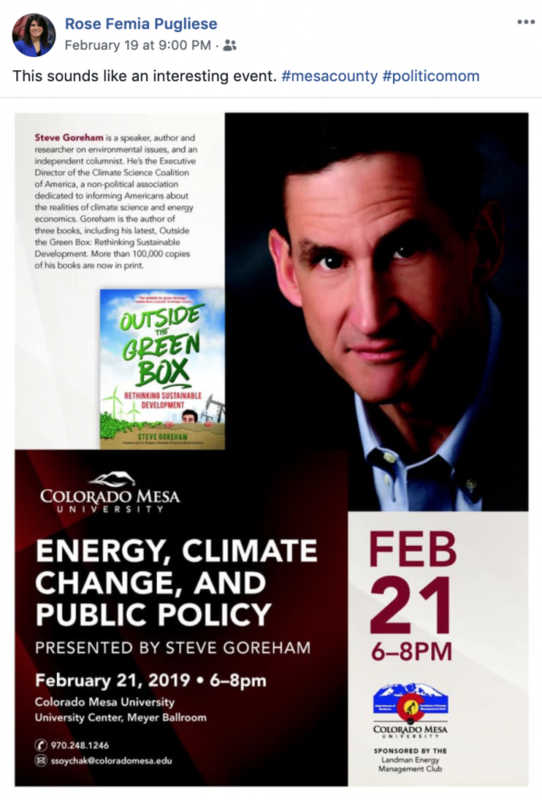 Goreham is the Executive Director of the Climate Science Coalition of America and a policy advisor to the Heartland Institute, a Koch-funded advocacy group that has disputed the reality of climate change and global warming for decades. Murray’s speech addressed “The State of White America” and largely focused on the widening income gap between rich and poor Americans. Following the speech, an audience member asked Murray to explain the “intolerance and fear of new ideas” of the “New Elite,” Murray’s label for wealthy American intellectuals. Question: Could you explain why the “new elite” has become so close-minded and intolerant and just frightened of ideas if they don’t follow whatever the spiel is on NPR? Dr. Murray: To answer that you have to say, “What does the political correctness go back to?” I guess it goes back to both the feminist and civil rights movements, which had great moral authority, certainly among the new upper class and academia. And deserved great moral authority. By the way I’m being very speculative here. I’ve thought about this a lot; I can’t document it. In a way it became obligatory to not say things that seemed to be critical of blacks or of women. A raised consciousness about both minorities and women that appropriately produced a sense of guilt. That’s fine- no problem with that, but it went too far. And it stifled the expression of certain kinds of beliefs and that has kind of snowballed. So first it was African Americans and women, and then you added homosexuals and then you added the disabled and then you went on down through the list and you have one group after another who has taken a victim status which circumscribes further the bounds of permissible discourse on all sorts of topics. Colorado Sen. Cory Gardner is officially running for re-election next year. This event invitation appears to put to rest speculation among political pundits that Gardner may have been thinking about stepping down in the face of discouraging poll numbers. Former Colorado Treasurer Walker Stapleton shared a new money-making strategy with his Twitter followers today: invest in water! 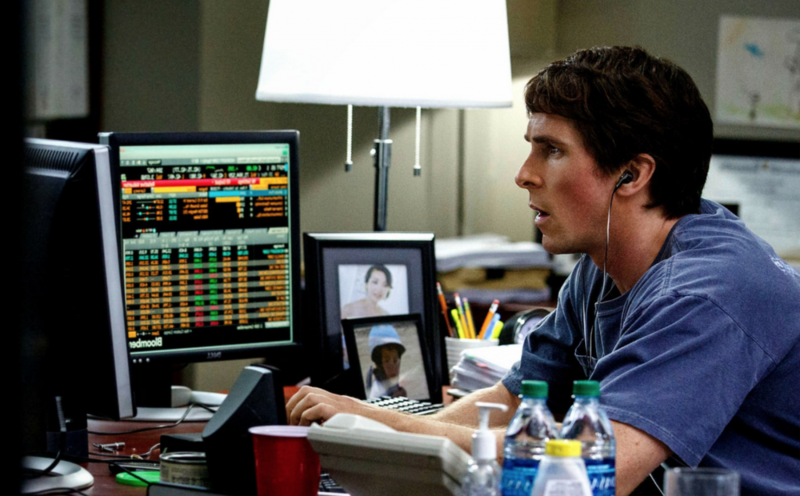 For those who haven’t seen the movie, Dr. Burry is one of a handful of financial speculators who anticipated the 2008 mortgage crash and bet against the market, making billions off the massive losses in value sustained by millions of American families, homeowners and retirees. By 2025, an estimated 1.8 billion people will live in areas plagued by water scarcity, with 2/3rds of the world’s population living in water-stressed regions. …Ask the residents of Flint, Michigan, who are experiencing firsthand the effects of America’s aging water infrastructure. Clearly there’s a growing and critical demand for access to freshwater and for related products and services. So how can an intelligent investor profit from it? None of this is news to those of us in Colorado, where drought conditions have lowered reservoir levels to near-record lows. Last year’s snow-melt was so small that the Colorado River Basin received just a third of its average annual water volume. This forced the state to close the Yampa river to fishing and boating last summer and eventually to cut water to some users in September. It’s been nearly a century since The Little Engine That Could first charmed children with its cheerful smile and can-do attitude. These days, kids love characters such as Thomas the Tank Engine and the cast of “Toy Story,” all of whom continue the tradition of entertaining young minds while teaching fundamental lessons about overcoming life’s challenges. Author and Air Force wife Liesl Ross just published her children’s book to help kids –like her own who are growing up on military bases– cope with a challenge that’s especially familiar to families in the armed services: moving to a new home. The Colorado native and daughter of Congressman Scott Tipton (R-CO), wanted to tell a story that would resonate for the kids on the base. The hero of Ross’ story is also a kid who’s faced with moving away from the only friends and neighborhood she has ever known. And like Thomas the Tank Engine, she’s also a vehicle with a cute smile. 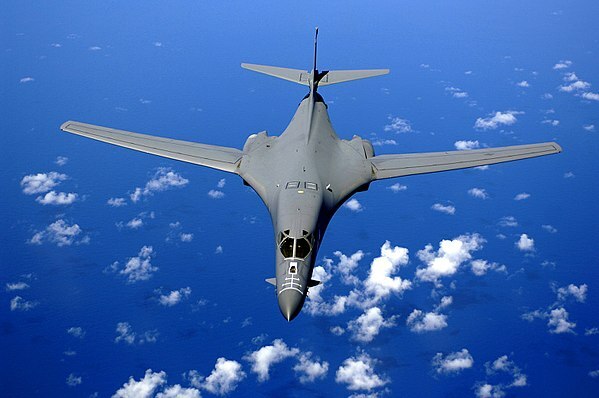 The B-1B Lancer is a supersonic heavy bomber that carries the largest payload of both guided and unguided munitions in the Air Force. It has served in combat over Kosovo, Iraq, Afghanistan and most recently in Syria. Initially designed to carry nuclear weapons, it was converted to strictly conventional use in the 1990s. The Air Force currently retains an active inventory of 62 aircraft assigned to squadrons at Dyess AFB, Texas and Ellsworth AFB, South Dakota, where Ross’ family resides. 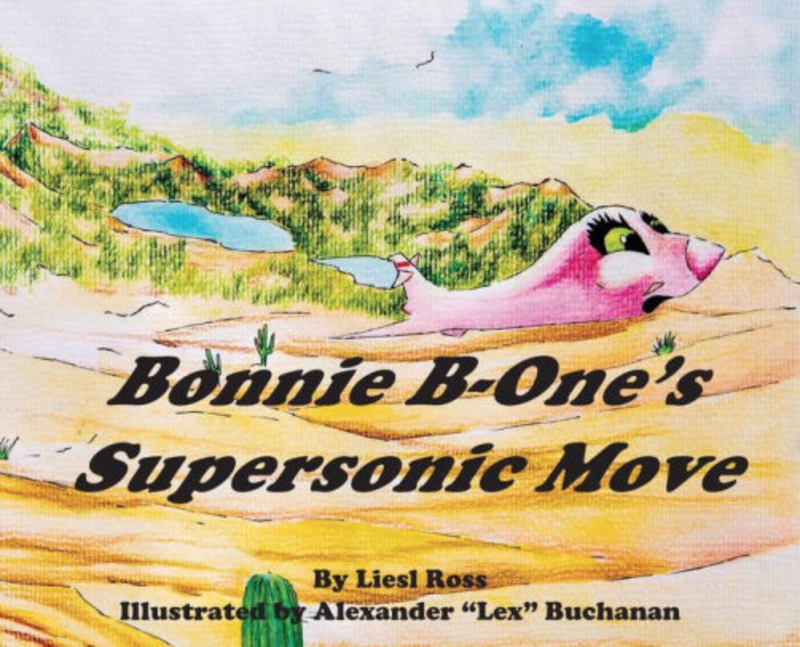 Ross and her illustrator, airman Alexander Buchanan who is also stationed at the base, were featured in a story about their book last Friday by the Rapid City, South Dakota NBC affiliate. UPDATE: Senator Hill replied with a statement at the end of this post. Governor Jared Polis took the oath of office today on the west steps of the state capitol. The ceremony featured a diverse group of speakers, religious leaders, poets and performers, all celebrating the inauguration of Colorado’s 43rd governor. The two poets on the inaugural agenda were Anne Waldman and Toluwanimi Obiwole. Both have received considerable acclaim for their work. Colorado’s conservative activists are furious at U.S. Sen. Cory Gardner’s call to end the government shutdown without funding for President Trump’s wall. County GOP officials and Tea Party leaders are talking openly about the need for a primary challenger in 2020. 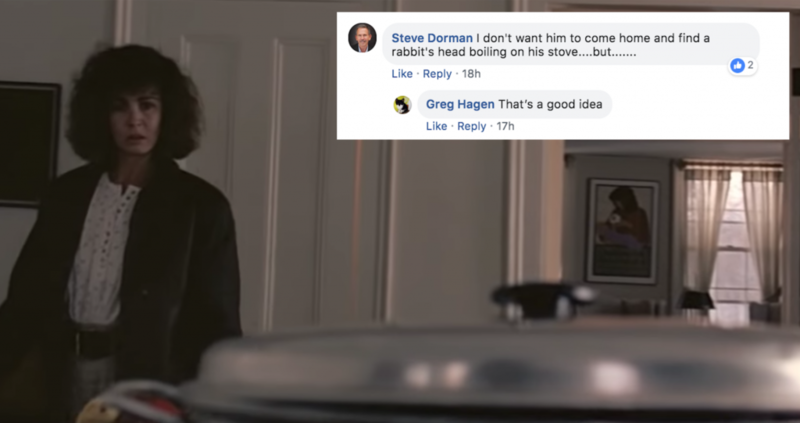 One official went so far as to joke about boiling a bunny on Sen. Gardner’s stove. Though presumably tongue-in-cheek, this quip is particularly dubious in light of a threatening video of a beheading Gardner’s wife received via text message back in October. Our RINO U.S. 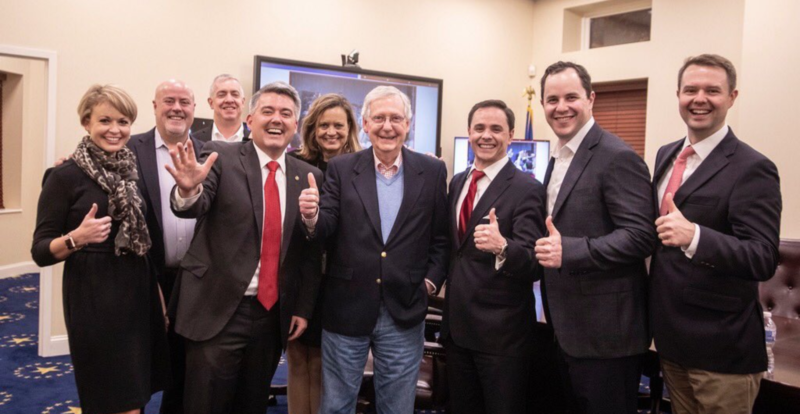 Senator Cory Gardner just announced that he would vote to re-open the complete federal government, with no money for a wall. I think it’s time that he gets ready for a primary in 2020. He won’t win in blue Colorado by trolling for Democrat votes. On Friday, Anil Mathai, chair of the Adams County Republicans, agreed with radio host Peter BoyleS that Sen. Gardner is a “useful idiot,” or easily manipulated pawn, presumably of establishment conservatives.